NOAA released video of the nor'easter hampering Thanksgiving travel on the east coast of North America, Nov. 26, 2014. 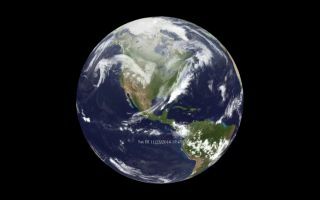 The National Oceanic and Atmospheric Administration's weather satellites captured the beginning of the nor'easter that is expected to wreak havoc for Thanksgiving travelers today (Nov. 26) with rain and snow. In the satellite video, clouds can be seen forming along the path of the storm on Monday evening (Nov. 24; the date and time are displayed on the lower half of the screen). The video shows another group of clouds blowing over the Northeast on Sunday (Nov. 23) and Monday, but the Thanksgiving storm starts to take shape farther south, following a curved path that dips all the way down to Mexico. The National Weather Association said in a statement that this will be a rapidly moving storm, and that most of the precipitation will fall in a 12-hour time frame. The storm is already dropping rain on Florida and will reach Canada's eastern provinces by Thanksgiving morning (Nov. 27). Rain and snow are expected to fall on all major East Coast cities, including Washington, D.C., Baltimore, Philadelphia, New York and Boston. NOAA reports that it expects 3 to 6 inches (7.6 to 15.2 centimeters) of snow in the Interstate 95 corridor, and 6 to 12 inches (15.2 to 30.5 cm) "further inland and over higher terrain, particularly in the southern Poconos and northwest New Jersey." Nor'easters earn their name because "the winds over coastal areas blow from a northeasterly direction," according to NOAA's website. Nor'easters are cyclonic storms (meaning they rapidly spin in toward a central spot) that move up the East Coast of the United States. "Nor'easters may occur any time of the year, but are most frequent and strongest between September and April. These storms usually develop between Georgia and New Jersey within 100 miles of the coastline and generally move north or northeastward." "The East Coast of North America provides an ideal breeding ground for nor'easters," according to NOAA. In winter, Arctic air is transported south and then east across the plains of the United States and Canada. The cold air bumps into warm air from the Gulf of Mexico and the Atlantic trying to move north. "This difference in temperature between the warm air over the water and cold Arctic air over the land is the area where nor'easters are born," the NOAA website said.